New York: Dover Publications, Inc, 1973. Paperback. xi, 364p., sewn signatures, very sound, huge softbound in 12x9 inch pink wraps. Slightest external edgewear, inside is completely clean, unmarked and sound, a very good copy. New York: Melrose Music Corp, 1948. 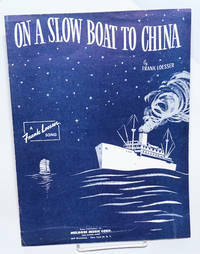 Single large folio leaf printed and folded to make a typical two-page sheet music spread with monochrome cover illustration and a terminal page advertisement for other 1948 efforts (none so durable as this). Item very slightly edgeworn with some light creasings along its bottom edge, paperstock faintly toned, no markings, a very good copy. "I'd love to get you ON A SLOW BOAT TO CHI-NA, All to myself, a-lone. Get you and keep you in my arms ev-er-more.. Out on the briny, with a moon big and shiny.." Emptor to expect just the one stanza; "There is no verse to this song, 'Cause I don't want to wait a mo-ment too long..
no place: California Catholic Daughters of America, 1976. [4p.] 8.5x11 inches, very good, red, white and blue flag design on self-wraps. 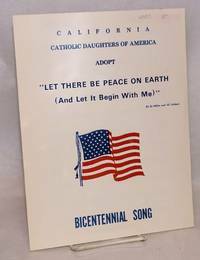 A Bicentennial piece from California which includes the music and lyrics to the popular song from 1955 and the story of the song which began at a workshop in the California mountains. New York: F.B. Haviland Pub. Co, 1929. 5p., sheet music, mild edgewear. 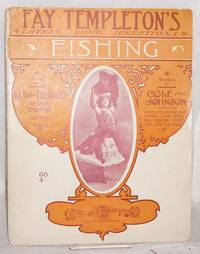 "Sung with sensational success by the peerless Duncan Sisters." Rosetta Duncan, pictured at left, was lesbian. New York: Joseph W. Stern & Co, 1914. Sheet_music. 8p. 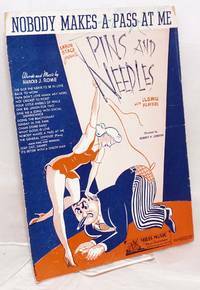 includes covers, 11x13.75 inches, lyrics, music, chord symbols in red ink added by previous owner, edgewear and spinfold re-enforced, sheet music in orange and white pictorial wraps. Delaware Water Gap, PA: Shawnee Press, 1970. 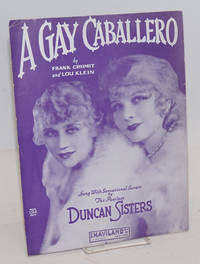 Two pieces of sheet music for the song, 8p. each, 7x10.5 inches, very good condition, one in red decorative wraps and the other in green. 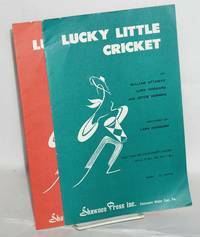 Children's song by Attaway et al, two slightly different arrangements by Hoggard, one for Mixed Voices (D-121) (S.A.B.) and one for Two or Four Part Voices (S.A.) (T.B.) or (S.A.T.B.). 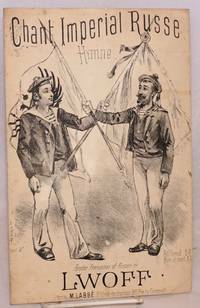 Paris: L. Labbé, n.d.. Four-panel sheet music, with lyrics in French and transliterated Russian, cover design depicting two sailors (a French and a Russian) flourishing crossed flags. Rear panel lightly soiled. Horizontal crease not evident from front. OCLC lists a holding as 1891, but this example has no date. New York: Carl Fischer, 1917. 13p., very good in wraps. 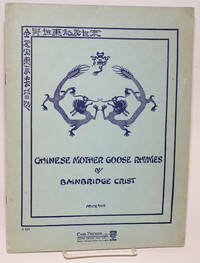 Sheet music with the lyrics in English. Boston: Boston Music Co, 1918. 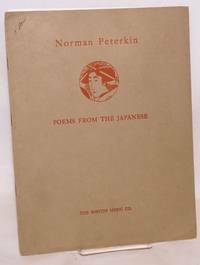 [9p. ], sheet music in mildly edgeworn wraps, ownership signature at upper left corner of front cover. Translated Japanese poems set to music, their titles being Dew, At the Gate, A Farewell, The Guest, and The Forlorn Hope. Berlin: Musikverlag/Ursula Davis, 1967. Sheet_music. 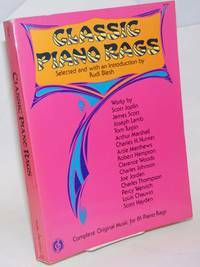 13p., 8.25x11.25 inches, press excerpt, sheet music for 5 songs, very good in stapled pictorial wraps. Expatriate Black jazz saxophonist in Paris and Berlin. New York: G. Schirmer, 1928. 12p., 9x12 inches, pictorial wraps showing masked faces in several tones of blue on buff; penciled 1, 2, 3, etc next to measures of music, otherwise very good. Words and music to "Gwine to Hebb'n. By Caldwell, Anne, et al. New York: Chappell & Co. Ltd, 1914. 5p., sheet music, short closed edge tear, otherwise very good in wraps. Stereotypical depiction of two Chinese men with queues. This musical featured a Beijing toy shop where the toys came to life. 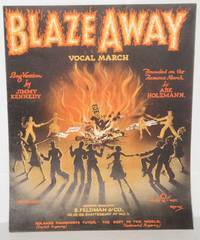 The singer of this song celebrates his newfound love with an American woman, which turns tragicomic in a later song. New York: G. Schirmer, 1919. 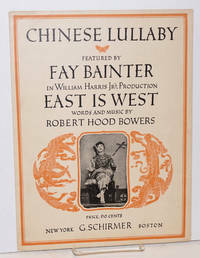 3p., sheet music with pictorial wraps featuring the actress Fay Bainter in Chinese drag as "Ming Toy." Very good. 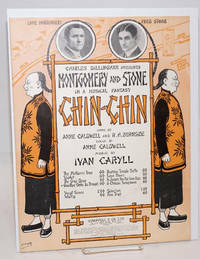 "Sing song, sing song, so Hop Toy / Allee same like China boy, / But he sellee girl with joy: Pity poor Ming Toy! New York: Leo Feist, 1916. 10.25x13.5 inch sheet music in colorfully illustrated wraps, small tape internal repair, otherwise very good. 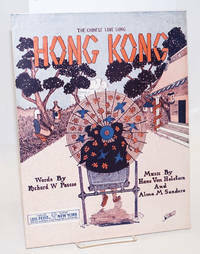 "There are many oriental places, Down in Chinatown / There are many oriental faces, With almond eyes of brown..." Song about a man working in a toy shop who laments his separation from a woman in Hong Kong to whom he promises to return. Mexico City: Promotora Hispano Americana de Musica, SA, 1940. 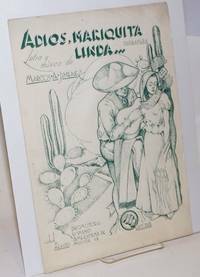 Four-panel sheet music with cover illustration of a balladeer serenading a demure woman leaning against a cactus; 9x13 inches, very good. Original copyright 1925; this issue noting tradsfer of copyright as of 1940. New York: M. Whitmark and Sons, 1926. 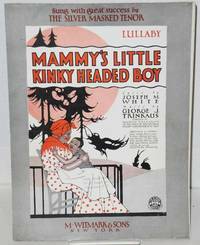 5p., sheet music, very good but for music shop's stamped address; with cover image of a seated mother holding her young son. 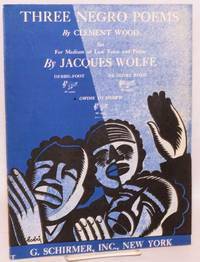 The lullaby was recorded by Paul Robeson, among others. Joseph M. White was known as the "Silver Masked Tenor. Boston: Walter Jacobs, 1904. 5p., sheet music, very good. 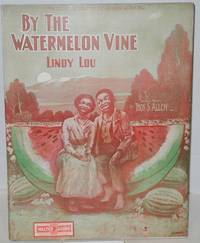 Cover image depicts a Black couple exchanging amorous looks while perched on a giant slice of watermelon under the moonlight. Love song about meeting Lindy Lou by the watermelon vine down in Louisiana. New York: Leo Feist, 1920. 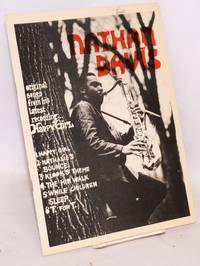 4p., sheet music, very good but for music shop's stamped address; with cover image of an African American banjo player. 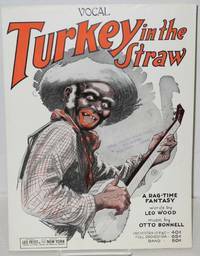 The tune is familiar even today, though many may not realize that Wood's lyrics to the chorus were "Funniest thing I ever saw, was when I watched that darkey play the Turkey in the Straw. New York: Mills Music, 1938. Sheet_music. 8p. including covers, 9x12.25 inches, sheet music and lyrics, ownership name on front cover, worn pictorial wraps. Music for a song from the musical "Pins and Needles" staged by the Labor Stage with the ILGWU Players directed by Robert H. Gordon. Ownership name of Mike Kitay, Thom Gunn's partner in San Francisco on cover.